Nobel Prize winner Yunus has a new idea for attacking poverty through capitalism: Enlist companies whose mission is to change the world, writes Alan M. Webber in USA Today. I agree with the observation of Alan when he said at the end of the article that ‘It’s the kind of creative economic thinking that could earn Yunus a second Nobel Prize — this time in economics’. Muhammad Yunus At Vancity, where I work, we recently created a division called Social Finance. This is where our Business Banking department now resides, as well as Commercial Mortgages and our amazing Community Business Banking team, where many of our most innovative and socially relevant products and services are generated. SINGAPORE is a global business centre with room for ‘social business’, according to Nobel laureate Muhammad Yunus. That is what the Bangladeshi economist and a pioneer of micro-credit calls not-for-profit businesses and programmes set up to generate jobs and other opportunities to help those trapped in poverty. 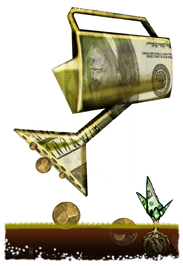 ‘Social business’ is not charity, but more in keeping with the adage: It’s better to teach a man how to fish than to give him fish. 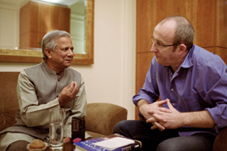 Professor Muhammed Yunus has made his name as one of the most successful and innovative social entrepreneurs in the world. In 2006, he was awarded the Nobel Peace Prize for setting up the Grameen Bank, which has given small loans to thousands of people in Bangladesh, helping them to start up their own businesses and lift themselves out of poverty. Now, he is transforming the world of big business by joining forces with multi-national dairy firm, Danone, and water services company, Veolia, to bring nutritional yoghurt and drinking water to the masses. Here, he talks to one of England’s own social success, Liam Black, about the future of social business, the battle with fat cats and what he would do with a magic wand. 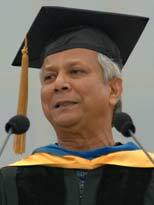 Below is the prepared text of the Commencement address by Muhammad Yunus, winner of the 2006 Nobel Peace Prize, for MIT’s 142nd Commencement held June 6, 2008. It as a very special privilege for me to speak at the commencement ceremony of this prestigious institution. What a wonderful feeling to be here today. To be with all of you, some of the brightest minds in the world, right at a moment when you decide the path you will embark on in life. You represent the future of the world. The choices that you will make for yourself will decide the fate of mankind. This is how it has always been. Sometimes we are aware of it, most of the time we are not. I hope you’ll remain aware of it and make an effort to be remembered not simply as a creative generation but as a socially-conscious creative generation. Try it.